Providence Academy Word | Sorry, Gotta Run! While the calendar may still say it is autumn, there’s no denying that winter is here. With the falling of the leaves comes the eventual fall of Providence Academy fall sports teams. There is one team, however, that is still fighting to keep their competitive season alive. 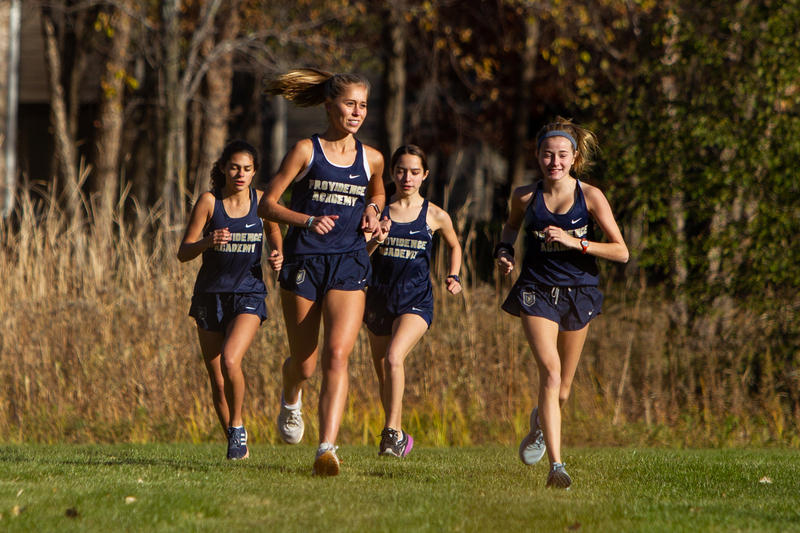 The PA Cross Country team has three runners – Emma Kelly ‘22, Maddie Kelly ‘20, and Riley Nechanicky ‘19 – going strong. These girls have surpassed their high preseason expectations to make it to the Regional competition. The girls had plenty of hurdles to clear on their quest to Regionals. The Section Meet was the first step. With 150 girls running, the odds were stacked against the three PA athletes. Nevertheless, Nechanicky and the Kellys were not fazed – they had not come to lose. All of their hard work ended up paying huge dividends as the three girls finished in the top 15. Maddie Kelly dominated, finishing in first place with a blazing 19 minute, 13 second race. The PA girls team placed second of the 21 total teams at the meet. With such strong results, Nechanicky and the Kellys were able to move on to the next round: state! The State Meet was held at St. Olaf College. 175 of Minnesota’s fastest female runners were there, all striving for strong finishes. Continuing the trend, the PA girls again placed very well at this competition. Maddie Kelly led the way with a remarkable 10th place finish, earning an All-State award. Riley Nechanicky and Emma Kelly continued to impress, posting competitive times as well. In the end, the girls placed tenth at the Nike Regionals Meet, last Saturday in Sioux Falls, SD, adding an exclamation point to an already stellar season. As the PA girls Cross Country team demonstrated time and time again, hard work really does pay off.